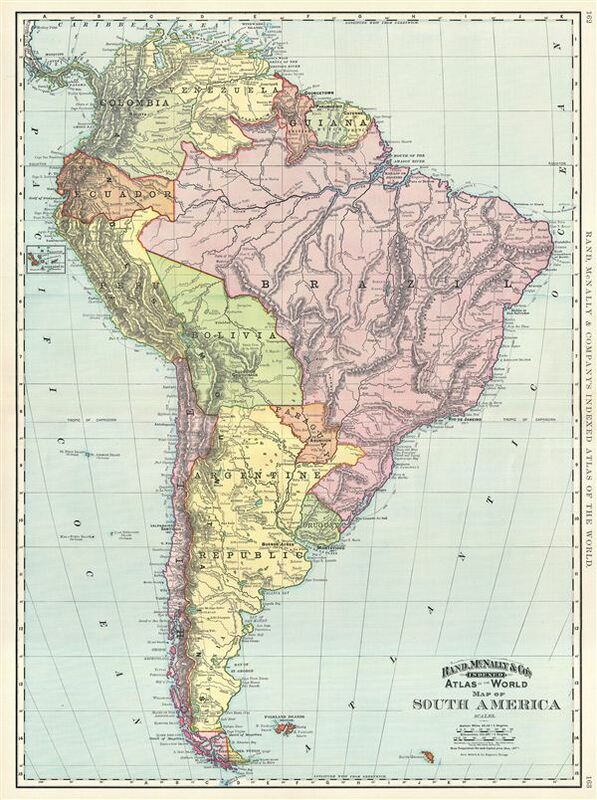 This is a beautiful example of Rand McNally and Company's 1892 map of South America. It covers the entire continent from the Caribbean to Cape Horn and from the Pacific to the Atlantic. The Falkland and South Georgia island groups are included. A small inset near the left border features the Galapagos Islands. Features surprisingly accurate detail of the interior of Brazil and the Amazon Basin. Various submarine cables are noted along the coast. The Marshes of Xarayes in Brazil and the Great Salt Marshes in Argentina are identified. Color coded according to countries and regions, the map notes several towns, cities, rivers, mountains and various other topographical details with relief shown by hachure. This map was issued as plate nos. 162 and 163 in the 1895 issue of Rand McNally and Company's Indexed Atlas of the World - possibly the finest atlas Rand McNally ever issued. Rumsey 3565.044 (1897 edition). Philip (atlases) 1026 (1898 edition).